HUE, Vietnam (CNS) — Father Thaddeus Nguyen Van Ly, a human rights campaigner jailed by Vietnamese authorities, was released from prison three days ahead of the May 22 arrival of U.S. President Barack Obama. In photos released by the Archdiocese of Hue, the 80-year-old priest can be seen kneeling — with assistance — before the archbishop upon his return to his parish, reported ucanews.com. The archdiocese reported that the priest was in good health. 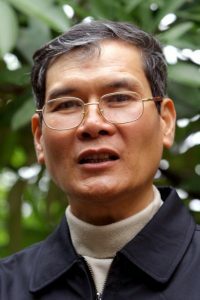 Ordained in 1974, Father Ly had spent more than two decades cumulatively in prison and 15 years under house arrest on a range of charges related to his activism. The latest arrest dated back to 2007, when he was sentenced to eight years in prison and five years house arrest on anti-government activities. He was released in 2010 to get treatment for a brain tumor, only to be reimprisoned the following year. Father Ly had been an outspoken rights activist, campaigning for democracy and freedom of speech and speaking out against the government confiscation of church property. While his release was welcomed by the U.S. government, his sentence was about to end regardless. Arrested Feb. 19, 2007, Father Ly was handed an eight-year sentence that was suspended between March 15, 2010, and July 25, 2011, meaning he was released barely one month short of serving a full eight years. It is unclear whether he still faces a five-year probationary house arrest that was part of the original sentencing, ucanews.com reported. A priest in Hue City who asked not to be named told ucanews.com that government officials informed Archbishop Francois Xavier Le Van Hong of Hue that Father Ly would be granted a special reprieve for the 126th anniversary of Ho Chi Minh’s birthdate May 19. Rights groups have been pressing Obama to use his trip to push the Vietnamese government to release political prisoners and tie trade deals to human rights. An estimated 130 people are currently imprisoned for acts of peaceful dissent, according to the International Federation for Human Rights. Last month, a coalition of 19 groups, including Christian Solidarity Worldwide and Human Rights Watch, sent an open letter to Obama highlighting attacks on defenders of human rights and religious freedoms. “We therefore strongly urge you to take the opportunity of your visit to Vietnam to make clear, both in private and in public, that U.S.-Vietnamese relationship will not fundamentally advance absent meaningful human rights improvements, including the release of imprisoned activists, an end to harassment of civil society groups, and respect for international law,” the letter read.